Combo for Nicotine (can be done from crossup jump ): St. > + (3 hits) > + or + or + (II) or + (VI). Solid gameplay from Xiao Hai but El Rosa's Ramon is the crowd favorite in the tournament. Hope that Ramon's included on the demo so I can try and learn him. 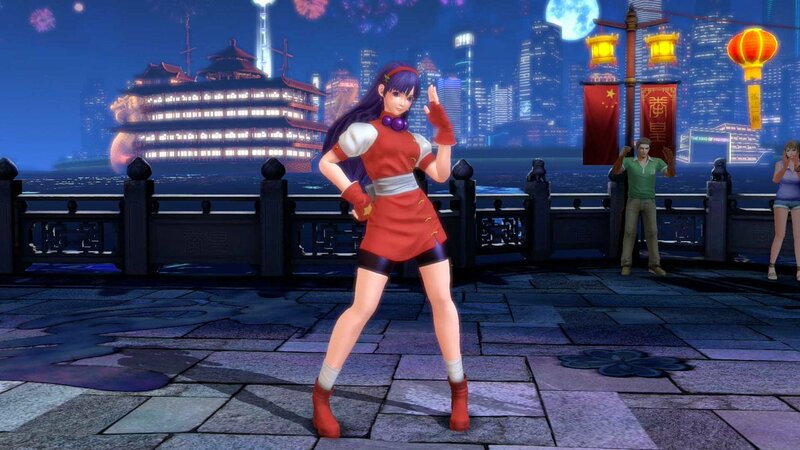 I knew Yuri's clothes rip in AOF but apparently Kasumi's do as well? I never knew that. Is Nightmare Geese a costume like Classic Kyo? My Day 1 team will be the Ikari team. They are my go-to characters on tourneys. Will try the newcomers as well. ESRB description of KOFXIV has passed for the "T" for teen rating! One female character's special attack depicts her pulling an opponent's face to her breasts. Is this the one they are referring to? Looks more to me like the Women Team stage. Yup, you're right. The stage resembles the old '94 Women Fighters Team stage. I checked the screenshot gallery at Deep Silver and KOF XIV's official sites and they don't have that image.